Ternitz (A) 17. 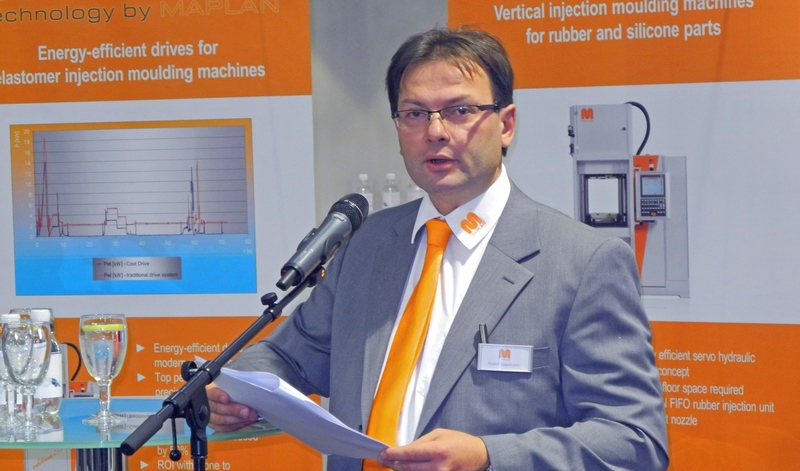 October 2013: At K 2013, Maplan showed a representative cross-section of solutions for elastomer processing. 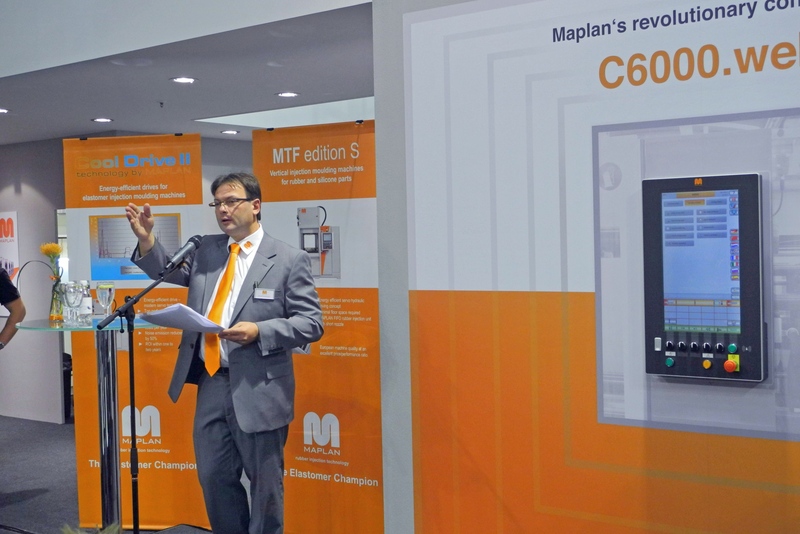 The focus was on semiautomate and fully automated manufacturing concepts, systems for energy-efficient production of moulded parts and options to ensure a consistently high quality of parts. Since we are confronted in the elastomer field with a large variety of products required in manufacturing parts, it is necessary to meet these requirements by optimally combining the machine, the cold runner / tool and the process optimization system. This wide ranging spectrum goes from the “simple” O-ring to the complex multi-component structural elements with different inlay parts. Each product requires a special know-how in relation to tool and cold runner technologies. MAPLAN is working in collaboration with both well-known cold runner or tool manufacturers and software providers. Cooperation with respective specialised partners and their expertise ensure that we can offer our clients the best and market-based solutions for their current venture. In collaboration with PETA Mould Construction GmbH from Bad Soden-Salmünster, Germany, a project for the fully automated production of Frisbee discs or membranes arose. The mould possesses two cavities of different sizes. Direct injection into the cavities is performed through a two-nozzle cold runner using hydraulically actuated shut-off nozzles. In order to achieve an optimal degree of filling individual cavities, the shut-off nozzles on the machine’s control system are adjusted separately. The result is perfect moulded parts, conservation of resources and, in view of the cost effectiveness of the user, production without any waste of materials. The demoulding of the moulded parts employs a middle plate sliding system used in conjunction with a pushout device. 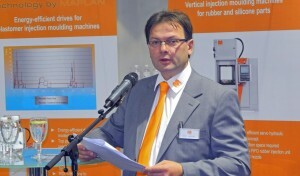 MTF750/160editionS of the “edition” series is a machine with a clamping force of 1600 kN and a dosing volume of 750 ccm. This machine comes with a standard energy-saving, servo-electric CoolDrive II drive concept. Comparing to a conventional drive concept, it saves more than 50% of energy. The use of a DCI tempering device which is regulated on a demand basis contributes additionally to enhancing energy efficiency of the overall system. The optimal quality of parts in the best economic aspects is ensured by the control integrated Cure² process optimisation system. This system monitors all relevant production parameters in real time and calculates the optimal heating time for the moulded parts using current data. As a result, a consistently high quality of parts is guaranteed and the safety margins can be largely eliminated, which in turn will increase productivity significantly. Over 40% increase of productivity has been demonstrated by clients in practice. This machine displays the optimal implementation of a customer specific manufacturing concept. This is the result of a cooperation based on a yearlong partnership with Vorwerk Autotec GmbH & Co. KG from Wuppertal in Germany. The focus is on the combination of different sliding systems that can also handle heavy tool weights of several thousand kilograms with high precision. In order to feed the inlay parts into the system fast, the customer’s machine is coupled with yet a Liftmaster system. Thus the loading time in the machine cycle is limited to a few seconds. Consequently, an economic, semiautomated production process for the manufacturing of metal-composite parts in the automotive industry is realised. The “ergonomic” clamping unit concept with low operating height provides the optimal conditions for semiautomatic manufacturing concepts with user intervention. This exhibit is equipped with an energy-saving servo- electric drive and an energy-saving tempering device. Additional drive aggregates and a comprehensive software package with many customer specific detailed solutions provide an optimal overall system which is tuned to the customer’s needs. A new frame size of CoolDrive II has been introduced for the first time in the course of this project for machines with a clamping force starting from 5000 kN. The energy saving potential is therefore proportional to the size of the drive. In general, we see – especially in Europe – a growing trend towards customer-specific solutions at a higher level of automation. We see “target engineering” – a process approach which is already in the planning phase – as a solution to this. We try to identify possible conflicts caused by different requirements posed on the design and translate them into an optimal solution.The result is preparatory activities initiated beforehand in order to create a sophisticated modular or platform system that ultimately reduces the “time to market” and makes competitive cost possible. Of course, the reduction of lifecycle costs while increasing the efficiency of machines and processes is an absolute trend. Looking from this perspective, energy consumption is not the largest part, but energy consumption will play an increasingly important role in the future due to rising energy prices. Considering the still very long service life of elastomer machines – 15-20 years – it makes even more sense to use the already available energy-saving technology. Since the costs – especially for new machines – are kept within bounds, there is also a correspondingly short payback period. 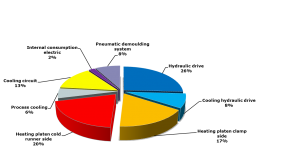 Consider the main consumption of energy in a typical elastomer injection moulding machine, the drive of the machine (power and cooling) consumes about 26% of the overall energy consumption, tool heating (including heat dissipating into the machine structure) consumes more than 30% and tempering and cooling consume about 20%. In the field of drives, the servo-hydraulic CoolDrive II system reduces both energy consumption and the cooling water required. In the field of tempering and cooling, optimisation can be achieved by the use of intelligent tempering devices which regulate on a demand basis. However, it would be much more efficient to reduce heat transfer by improving insulation from the inside in the tool / cold runner area. As a side effect, control performance and hence process stability can be increased. In the area of automation and ancillary equipment, the replacement of pneumatic drives by electrical as well as servo-electric drives offers saving potentials that should not be underestimated. Of course, a reduction of energy consumption per moulded part has to be achieved by the optimisation of the actual process using a process optimisation system. A heating time reduction of at least 10 – 20% is possible in most cases. In some cases, it goes far beyond that. In general, up to 50% of the total energy consumption can be saved by using these energy saving systems when compared to the older machines. The machine controller is often referred to as the heart of the machine. 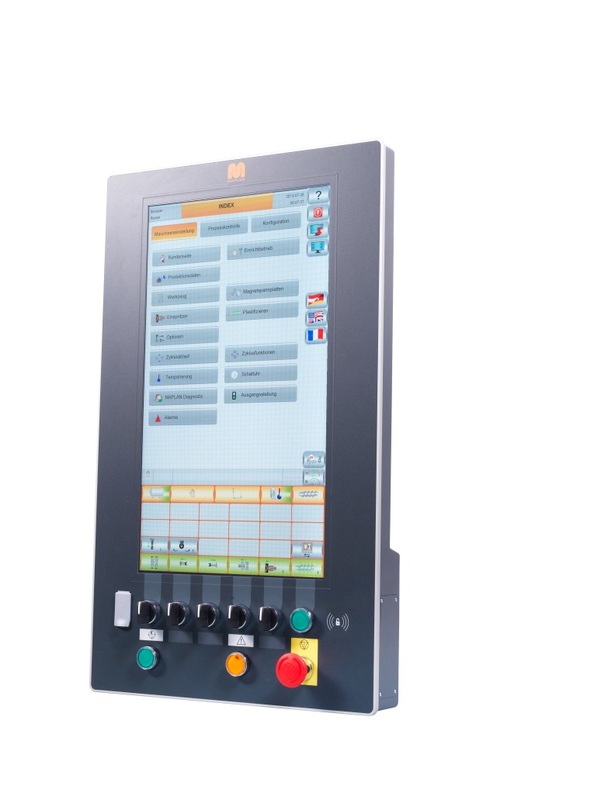 Indeed, the machine controller constitutes the central “intelligence” of the machine and, as a MMI (man-machine interface), provides for smooth communication between the machine and the operator. 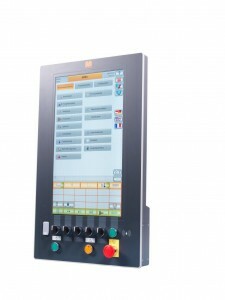 Apart from the main task of a machine control system, namely to control the process as accurately as possible, “usability”, “optimal visual representation” and “global connectivity” with respect to the operator are gaining importance nowadays. These aspects are becoming more important for the operator because they help him become better. “Better” in this context means: higher quality, more effective process design, value adding. These are major demands of the market which the machine construction industry must consider strategically. It is equipped with a 21″ full HD panel with multi-touch. It offers the ability of utilising different cross-platform terminals for visualisation. The central unit of the C6000.web itself relies on the latest Intel™ processor technology. Other characteristics of the hardware are fast industrial memory technology based on semiconductors, Powerlink system bus for connection of control components and the use of RFID technology for different tasks. Appropriate standard interfaces are of course available for the communication with higher-level systems. The special highlight: Visualisation on multiple independent terminal devices becomes possible. It is thus possible, for example, to work with more complex or simply larger plants with an additional control unit. This allows for a significantly more comfortable machine operation and to avoid the elaborate swivel arm systems. Or: The machine operator is currently correcting a dosing volume on the injection side. At the same time, the foreman is accessing the production data page on the computer in his office. 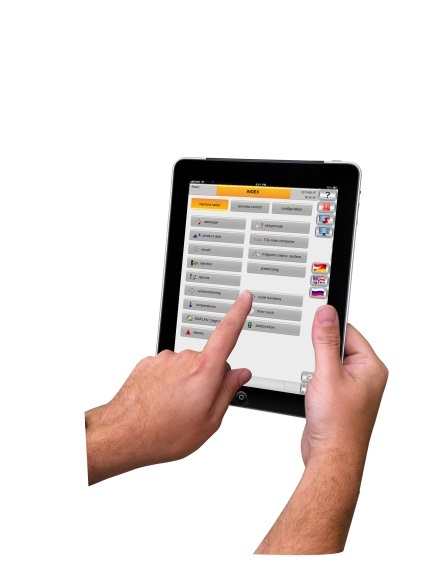 Our service technician who has an office in a very different plant of course can also simultaneously access the pages that are relevant for him. And finally, the plant manager wants to know if all machines are in operation. To this end, he is accessing the machine via his smart phone while waiting at the airport in Tokyo. All these operations take place in the background, unnoticed by the machine operator and everyone gets their specifically requested information. On the one hand, the C6000.web controller meets all complex technical control requirements and, on the other hand, it is yet intuitive and easy to use. In elastomer processing, the usability of the machine with gloves which are mandatory in this area must be ensured. This requires an appropriate generous layout of the controls on the screen or the use of industry compliant hardware buttons. Has the bottom neared in Asian PET markets?